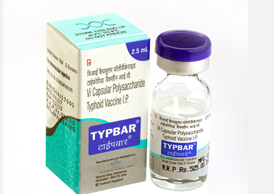 Typbar®, the first vaccine in India to get a WHO-GMP prequalification certificate, is a highly purified Vicapsular polysaccharide of Salmonella typhi Ty2. Typbar® would also be the world’s first vegetarian or non-bovine typhoid vaccine. Bharat Biotech is the largest primary manufacturer of typhoid vaccine in the country. The company dedicated the vaccine to Dr. John R. Robbins, the father of polysaccharide vaccines.